Home › Educational Design › HOW TO harness digital badges for RML? HOW TO harness digital badges for RML? Abstract: Digital badges are increasingly popular tools to certify extracurricular learning in higher education. Their digital nature, their flexibility, and their potential to encourage students to develop their self-directed learning skills are attractive characteristics that can be well aligned with Responsible Management Learning (RML) (Laasch & Moosmayer, 2015). This article explains the features of badges in general and describes what characteristics of a badge make it a suitable tool for RML. The “Application” section provides a step-by-step description of what is required when implementing a badge in higher education. The systematic and coherent development of student awareness, competence and skills that enable them to be responsible and ethical leaders in their future career requires curricular integration of these learning goals (Molthan-Hill, Hill & Parkes 2017, Warin & Beddewela 2016). However, there is also merit in offering learning opportunities for responsible management education beyond what is included in the regular study program (see e.g. Sunley & Coleman 2016 for a discussion on the “responsible learning mindset”). Many higher education institutions do this through short certificate programs (for example in business ethics) or individual courses offered by their dedicated PRME or sustainability Offices, through the Careers and Employment Office, or other institutional units. Digital badges are one novel approach to offering RML experiences and credentialing these in a way that is attractive to students and potential employers. They are not only a modern way of displaying student learning and achievement, but offer a range of advantages particularly for RML both in terms of student motivation and skills development. If designed appropriately, badges can have a range of advantages. This article describes what badges are, what advantages they offer for RML, and how they can be implemented. 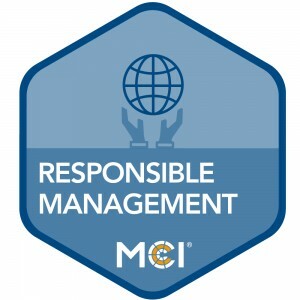 It is based on the experiences and lessons learned from a badge pilot program at Management Center Innsbruck in Austria, where the badge “Responsible Management” was introduced to certify student participation in a range of learning experiences, some mandatory and some elective, to develop their knowledge and skills in this area. A digital badge is an online record of achievement that documents the competences achieved and the work required to earn the badge (Educause Learning Initiative, 2017). It also contains information about the issuing institution, the issue date, and any additional data the issuer (institution awarding the badge) chooses to include. Badges are gaining increasing popularity and relevance as flexible digital credentials that allow for the recognition of informal and non-traditional learning, and play an increasingly important role in the context of self-directed and lifelong learning (for a discussion of the role of alternative credentialing in life-long learning, see e.g. Fong, Janzow & Peck, 2016). Badges can be issued via dedicated online badge platforms, or through an institution’s Learning Management System, or also by using self-hosted badging systems. The open standards employed in technical badge development enable good interoperability between the different systems used to generate badges. This means that badge earners (learners) do not have to worry about what issuing method the organisation they learn with uses, and badges can generally be moved easily across platforms (Educause Learning Initiative, 2013). In Higher Education, badges are particularly popular as a mechanism to recognise extracurricular efforts and achievements, and are an excellent strategy to motivate students to “go the extra mile” in important areas of skills development. In the context of RML, badges are a promising format at the intersection of university learning and career readiness. So far, there has been little agreement or standardization in terms of the “size” or “amount” of learning a badge should be awarded for. Whilst this is also one of the drawbacks of badges (particularly for employers or “consumers” of badges), it is also an advantage in that it provides for complete freedom for badge issuing institutions to decide what learning experiences their badges are awarded for. In an RML context, it means that badges can be awarded for a range of learning experiences such as project participation in workshops, work placements, service learning and community projects, and engagement for specific activities (for example involvement in PRME student initiatives). Responsible Management Learning must go beyond content acquisition (knowing and awareness) and into the realms of being (e.g. developing self-awareness and reflection) and doing (development of applied skills and competences) to have a lasting effect. Badges are by design competency-based, i.e. they certify that defined skills have been achieved. Thus they foster both a discussion amongst those planning a badge about what competencies RML actually encompasses as well as a focus amongst student participants on the competencies they work towards when completing the necessary badge activities. This is well aligned with the fact that some of the more effective learning strategies for RML include experiential, project based, and real world learning. Amongst other things, RML is about being able to accept and understand others’ perspectives and values, to develop tolerance, and to take into consideration diverse world views and values. Through participation in extracurricular activities such as badges, student meet and work with peers from different study programs, different disciplines, and also different cultures of international students take part. This mix can result in a richer learning experience particularly when it comes to understanding different value sets, cultural contexts, or ethical standpoints. Badges are an excellent way to recognise student engagement above and beyond what is required in their regular study program. Badges can be awarded for activities such as being a student representative, organising or supporting a student initiative or event, or participating in community service projects. They can therefore be an additional motivating factor for students to engage in this type of activities, particularly when students understand that badges add value to their career skills portfolio and increase their attractiveness for potential employers. The skills associated with responsible management learning are increasingly attractive to companies, and being able to demonstrate these through a badge adds to a student’s “Unique Selling Proposition” in the job seeking process. If badges have online components such as the requirement to complete online courses, MOOCs, or webinars, there is great potential for collaboration across different institutions. Students could easily attend online events and activities that are offered by a partner university. This way, the partnering institutions could both enlarge their educational offering, increase the participant numbers of online courses, and allow their students to interact with peers and lecturers from other organisations (possibly in an international context). Collaboration is also an option with companies and potential employees as many larger organisations are also starting to offer badges in their areas of expertise. Badges could be co-offered or also simply endorsed by each participating institution. In our digitized world, badges are an increasingly accepted currency. They are created in digital format, and can be managed and shared by students across their social media platforms and online spaces. Open badges are built on an architecture and technical standards that allows them to be shared freely, and they come with a level of certification that is traceable back to the issuing institution. They are associated with a visual image (the badge graphic) and are eye-catching and attractive. This makes them highly visible in the digital space – an attribute that is particularly valuable in recruiting processes, where that little special extra can make all the difference. 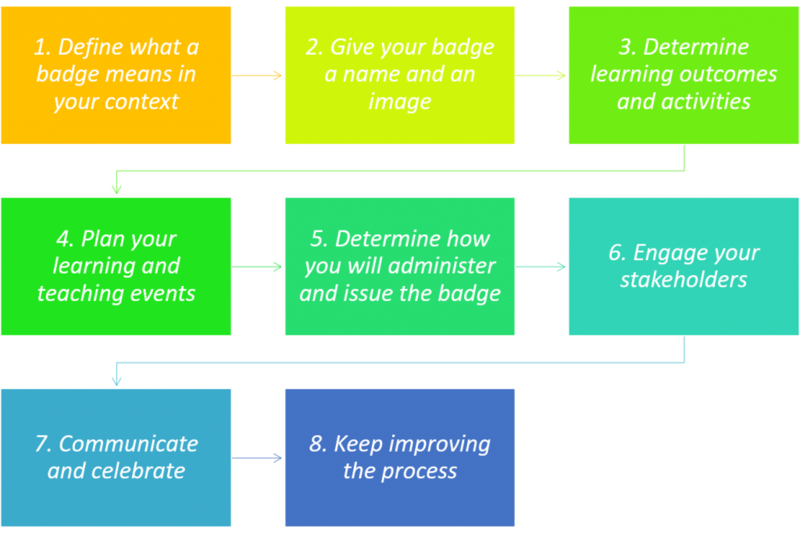 Many badge programs also include elements of gamification, i.e. learners are driven to learn more through the prospect of getting to the next badge “level” (e.g. bronze, silver, gold), or through earning “points” towards a badge. This gamification element can be an extra motivating factor. Badges are one way of documenting and managing learning outside a formal context, and are thus a good vehicle to get students started in developing skills in self-directed and life-long learning. By earning badges, students start to understand that they are the ones who are responsible for their ongoing learning and development, and that they can constantly enhance their knowledge and skills via a range of learning avenues, particularly in the digital space. Introducing badges is not difficult from a technical point of view, but it takes a lot of conceptual planning and informed decision making that includes consultation with key stakeholders and consideration of institutional needs and contexts. In the roll-out phase, clear and targeted communication are key to informing learners of the availability, characteristics, benefits and requirements of earning a badge. The following section outlines the main steps in this process and is illustrated in Figure 1 by key experiences we made at MCI with our badge pilot project. First of all, you will have to decide on the nature and the size of your badge, i.e. the amount of workload and individual learning experiences (be it courses, workshops, projects, engagement, etc.) you want your students to complete before they earn a badge. Be careful not to make your badge to small (so it has no value for your students or those who consume the badge) or too big (so it is too much work for students to do). Your decision here will depend on what you want to achieve with the badge and what your wider context is, e.g. if there are other badges you want to offer, if you want your badge to be comparable to others, or if you indeed want to use a staggered system, e.g. with bronze, silver and gold badges that build on each other. Finding the right balance here is important as it will determine what you can expect your students to achieve in terms of learning outcomes for a badge. At first sight, badges are visual items, and their look plays a crucial role in catching people’s attention and interest, so it is important to choose a suitable image. Aspects you may like to consider here are alignment with your corporate style (colour scheme, fonts, imagery, etc.) as well as the requirement to have the visual style you create for your first badges also hold for subsequent badges or series of badges. The name you choose for your badge should be clear and convey succinctly what the badge earner has learned so the value of the badge is conveyed immediately (particularly to badge consumers). This step is very much like designing a (small) curriculum, and it helps to choose a “backward design” process. You will first need to think about what outcomes in terms of attitudes, knowledge, skills and competencies your students should achieve in order to earn a badge. Ensure that you frame these in terms of competencies that are meaningful and relevant to students and potential employers alike. At this point, you may also want to think about the evidence you will need to see in order to assess learner achievement. When it comes to planning for the learning (and teaching) activities you want to include in your badge, it is advisable to build on what is already there (e.g. existing workshops, projects, or lectures) and to think laterally about what can be included. If you decide to include less “defined” learning and engagement activities, e.g. student engagement in service learning project or the like, make sure you have a way of “measuring” the effort here, or at least have a definition of what the minimum requirements are and who can confirm that student has achieved them so that the activity can be counted towards the badge. This step including planning how your badge earners will register for badge activities, how you will track their progress, and how you will issue your badge. A lot of this has to do with the technology you plan to use. Some badge platforms such as Open Badge Academy allow badge earners to upload evidence towards achieving their badge, and if there are no existing systems at your institution that you can use, this may be a good option. If you can employ your institution’s Learning Management System or Student Management System, it may be preferable to use these (also in view of data protection regulations you need to consider). The decision how you will issue badges is another important aspect. For this decision, you need to keep in mind a number of key selection criteria such as interoperability, ease of use, costs, accessibility, and vendor reputation. Once you have been through steps 1 to 5, you are ready to advertise your badge. We recommend starting with a pilot project and having a smaller group of students go through your first badge iteration. This gives you the opportunity to try your badge processes and gain valuable student feedback whilst still being able to make changes as you go without losing face. Engaging other stakeholders along the way is equally important, including your university leadership team, faculty, other support services such as IT Services, and student representatives. They can give you valuable feedback about embedding badges within the context of your institution and will provide perspectives you may not have considered. Communication about your digital badge program is important from a range of perspectives. You need to communicate to make the university community aware of the nature, existence and value of participating in your digital badge program. Make sure to also celebrate your badges and your badge earners (and help them make the badge visible) once the first lot of badges are issued. In addition to enhancing your graduates’ career skills and competencies (including responsible management awareness and skills), badges also have value as a tool to market your institution as they are displayed by your badge earners on a range of social media platforms – free advertising for your organisation as an innovative educational institution. Once your badge program is up and running, continuous improvement and innovation will keep it alive. Keep coming back to your focus in terms of the types of competencies your badges convey, and try to include employer needs as much as possible. Include your students’ ideas, particularly when it comes to engagement. Go beyond your institution in terms of the learning experiences and activities that count towards a badge (e.g. by recognising community project, or indeed the completion of MOOCs or other, informal forms of learning). And last but not least, keep focussing on badges as an important factor in helping your students become life-long, responsible learners. When implementing digital badges, project teams will come across a range of issues and unforeseen challenges, and they will learn a lot in the process of planning and rolling our their badge program. Sharing the lessons learned with peers through publications, conference presentation, entries on social media platforms or other means, will help the higher education community progress the thinking and practice in digital badge development. At the same time, it will also put the institution on the map as a “badge-active” university, and will pave the way for possible collaborations in this space. Educause Learning Initiative (2013). 7 Things You Should Read About Badges. Available from https://library.educause.edu/resources/2013/5/7-things-you-should-read-about-badges [last accessed 12 May 2018]. Molthan-Hill, P., Hill, S. and Parkes, C. (2017). A new framework for embedding sustainability into the business school curriculum. In: P. Molthan-Hill (Ed. ), The business student’s guide to sustainable management: principles and practice. A Greenleaf Publishing Book. London, New York: Routledge, pp. 13-50. Sunley, R. & Coleman, M. (2016). Establishing a foundational responsible learning mind-set for business in the 21st century. In: R. Sunley, J. Leigh (Eds. ), Educating for responsible management education. Putting Theory into Practice. Sheffield: Greenleaf Publishing, pp. 28-51. Warin, C. and Beddewela, E. (2016). Drivers, barriers and enablers of institutionalizing responsible management education. In: R. Sunley, J. Leigh (Eds. ), Educating for responsible management education. Putting Theory into Practice. Sheffield: Greenleaf Publishing, pp. 301-323.